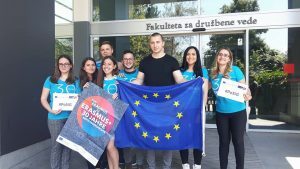 The euroPS consortium established the Student Board for the Joint Master in Political Science – Integration and Governance during their coordinators’ board meeting in Ljubljana on 27 May 2017. The PoSIG Student Board acts as a representative body of all PoSIG students and is composed of a student representative from each partner university. The Student Board represents all students enrolled in the PoSIG programme. The responsibilities of the SB are to: represent students’ rights and interests and to monitor whether these are taken into consideration by the partner universities; support and review the suggestions and decisions of the Coordinators’ Board and Quality Assurance Board; nominate one or two members of the Student Board to the Quality Assurance Board. 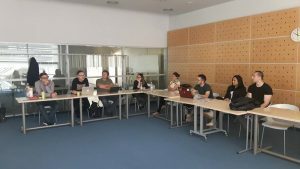 This first meeting served to get to know better the students, but also the to provide information about PoSIG, future activities and possibilities for students to engage more with euroPS consortium and PoSIG. Students had the opportunity to discuss a plan of action with one another and also select their representatives to Quality Assurance Board: Ardita Metolli, University of Salzburg and Florjan Muhaj, Faculty of Social Sciences, University of Tirana. Two students will present PoSIG e-learning opportunities and student support at the Final Conference in Sarajevo in June 2017: Megi Ruka, European University of Tirana and Ardita Metolli, University of Salzburg.